The adult Malaysian fruit fly is somewhat larger than a housefly, about 8 mm in length. The adult has two black spots on the face. The thorax is brown to black on top with paired yellow stripes at the wing bases, while the abdomen is yellow-orange without any dark markings. The clear wings have a dark stripe along the front edge that is swollen at the wing tip and one directed toward the back edge of the wing at the base. The female has a pointed slender ovipositor to deposit eggs under the skin of host vegetables and fruit. Eggs are minute and banana-shaped, and are laid in batches. The maggots (larvae) are creamy white, legless, and may attain a length of 10 mm inside host fruit. When mature, the maggots leave the host fruit and burrow into the ground, where they form rice-grain shaped brown puparia, from which the adults will eventually emerge. Malaysian fruit fly is native to Asia, and was first found in the U.S. in Hawaii during 1983, and by 1994 had spread throughout the state. There, it has emerged as a pest of solanaceous and cucurbitaceous fruit. A number of crops in California are threatened by the introduction of this pest including cucumber, eggplant, guava, peppers, pomegranate, tomato, and watermelon. The combined 2013 gross values of these commodities was over $2 billion. 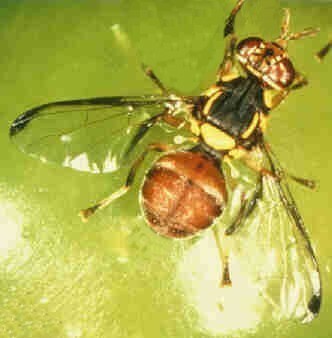 The permanent establishment and spread of this pest would result in increased production and postharvest costs to safeguard commercial fruit from infestation, increased pesticide applications on both production agriculture and residential properties to mitigate damage, and lost economic activity and jobs from trade restrictions. Malaysian fruit fly has been detected only twice in California, with one fly in 1998 and two in 2016. Malaysian fruit fly is widespread through much of the mainland of Southern Asia and neighboring islands, including Sri Lanka and Taiwan. It has spread to Kenya, Tanzania, and the Hawaiian islands. Females lay eggs under the skin of host fruits, and females may lay more than 500 eggs in their lifetime. The time taken for development depends on the ambient temperature. Maggots tunnel through the fruit feeding on the pulp, shed their skins twice, and emerge through exit holes in approximately 10 days under warm temperatures. The larvae drop from the fruit and burrow into the soil to pupate. After about 10 days adults emerge from the puparia. The newly emerged adult females need 5 to 14 days to mature sexually prior to egg laying. Breeding is continuous, with several annual generations possible. Adults live 70 days on average and feed on honeydew, decaying fruit, plant nectar, bird dung, and other substances. The adult is a strong flyer, and this ability allows the fly to infest new areas very quickly. More than 50 fruits and vegetables have been attacked, primarily in the families Solanaceae and Cucurbitaceae (see list below). Fruit that has been attacked will be unfit to eat as the maggots tunnel through the flesh as they feed. Decay organisms enter, leaving the interior of the fruit a rotten mass.